RYA Ranker, Mengeham Rythe SC, 8-9th April. 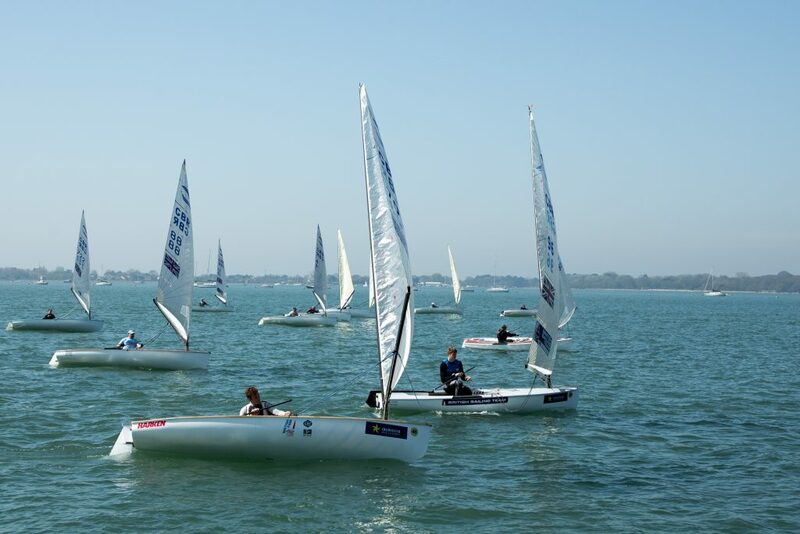 28 Finns travelled to Mengeham for the second of the RYA Spring Series of ranking events – 5 short sharp races per day to keep the fleet together and to provide plenty of early season starting and mark rounding practice in glorious sunshine and a positively tropical 21 degrees. 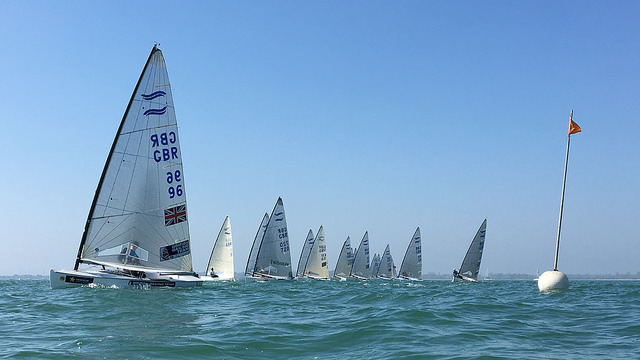 Usually held at Portland harbour, Mengeham kindly stepped in to host the event for the RYA and 6 Under 23 sailors were joined by 22 Masters – many of whom were keen for some top flight competition before the Master’s World Championships in Barbados in June. A light southeasterly breeze took time to establish for the early Saturday morning start after a heavy fog, but as soon as it settled in Race Officer Graeme Macdonald got the fleet off after a general recall in a 6-8 knot breeze. Julian Smith took the first race win after going hard left on the downwind leg to pick up the first of the shifting and building southerly breeze, sailing over the top of the early race leaders. Race two was memorable for Jon Tweedle – the only competitor to take the right hand mark at the bottom gate, he picked up a good shift and with clear air shot from eighth to take the winners gun on the short beat to the finish. The breeze built to 10 knot throughout the morning and shifted further south, requiring some slick mark moves to allow a quick turn around between races before the tide ran out. 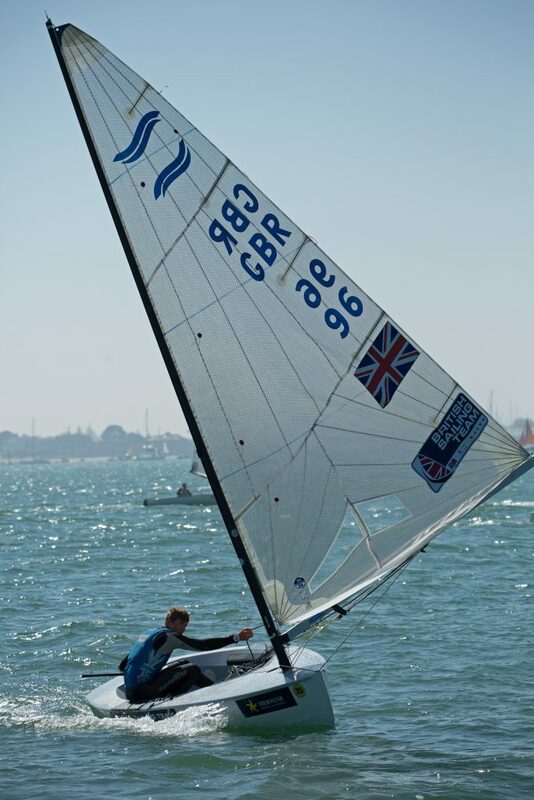 GAC Pindar Under 23 squad member Jack Arnell returning after a year’s injury lay-off threw off any rustiness after a first race BFD to record a 2, 7, 1,1 score for the first day and to lead overnight. 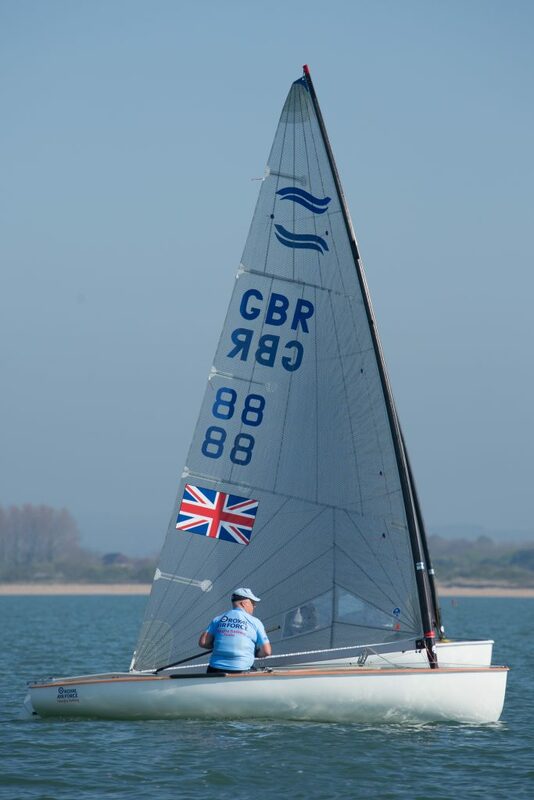 Other U 23’s found the flicking breeze and changing tidal conditions more challenging than they were used to and were further down the results, including Cameron Tweedle who was behind his Dad sailing his old boat! 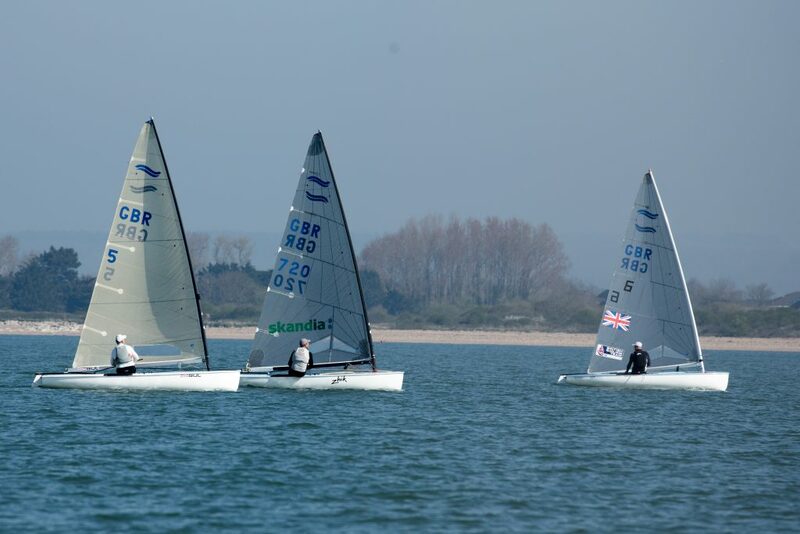 As time was running out on the race course and the sands clearly visible at the bottom gate the Race Team made a brave call to squeeze in a 5th race by moving the course into the Emsworth channel. As the competitors sailed back to Mengeham Rythe there was just enough water to make it home but it meant a muddy recovery of boats from the creek. Sunday brought a stronger and steadier breeze that allowed the racing to start bang on time, in perfect conditions of sun and an 8-10 knot Southeasterly. John Greenwood showed his experience to take the first race, followed by the consistant Jack Arnell and Julian Smith. The breeze again showed signs of moving south and the course was quickly adjusted to get a true upwind leg and the stronger breeze permitted longer races of two windward/leeward laps that allowed some come back from a poor first beat in the packed and close fleet. With races being turned around with a few minutes of the last finisher there was little time to recover and the action was full-on for the full five race programme. As the wind peaked at 10-12 knots the Oscar flag was raised allowing free pumping, much to the delight of the U 23 lads who could then make up more lost positions against the canny ‘old boys’ downwind. Cameron Tweedle looked more at home as he collected a 12,1,4,5,1 score line – taking the bullet after a great tussle with four other U 23 sailors in the final heat. 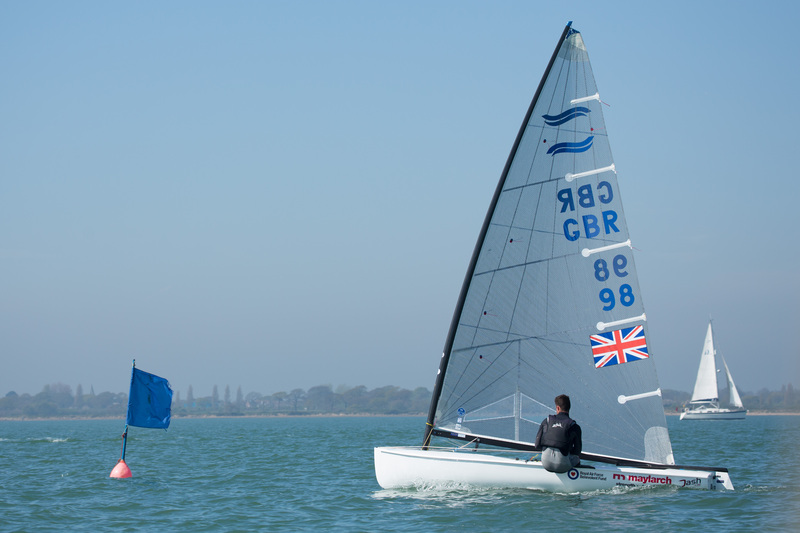 British Sailing Team member Hector Simpson showed his mastery of downwind sailing to claim a 1,1,2, score in the final three races – enough to take the weekend by a narrow 2 point margin from the GAC Pindar U23 squad’s Jack Arnell. Grand Master John Greenwood came in a deserved third, followed by Julian Smith and Allen Burrell, proving that the Masters are not past it yet!